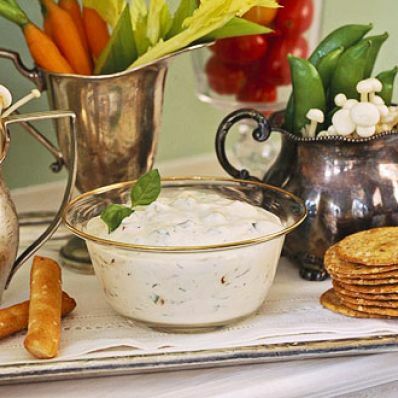 Sun-dried tomatoes and fresh basil impart the taste of the Mediterranean to a homemade ranch-style appetizer dip. 1 of 3 In small saucepan, bring water to a boil. Add tomatoes; simmer 3 minutes. Remove from heat; let stand 3 minutes to soften. Drain; let cool. 2 of 3 In bowl, mix sour cream, basil, mayonnaise, seasoning mix, milk, dried onion and garlic powder. Chop tomatoes into small pieces. Stir into mixture in bowl. Cover with plastic wrap. Refrigerate for at least 1 hour. 3 of 3 To serve, stir dip. Accompany with veggies, chips and crackers. Per Serving: 43 mg sodium, 47 kcal cal., 1 g pro., 1 g carb., 0 g fiber, 2 g sat. fat, 5 g Fat, total, 6 mg chol.